Monochrome CCD cameras require the use of multiple filters to achieve a colour image. 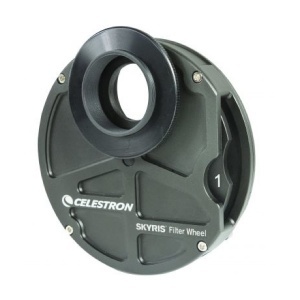 A filter wheel makes it easy to toggle between filters while imaging, without moving your camera or telescope. Simply turn the dial to scroll through your available filters. If you need to swap out a filter, just open the quick-release door to the internal carousel, replace the filter, and get back to imaging in no time. The filter wheel's sturdy, machined aluminum construction and high-quality components, including spring-loaded steel ball bearings, will give you years of enjoyment.